To learn how to deadlift, you must perfect your deadlift setup. The Deadlift setup – what is the best way to set up for your deadlift? The deadlift is seemingly one of the simplest exercises to do in the gym. However, the deadlift is also one of the most dangerous. Mess with the deadlift and you can really hurt yourself. Getting the deadlift setup right is critical for your deadlifting success and safety. Learning how to deadlift starts with learning how to achieve proper deadlift form. This will keep you safe and allow you to continue increasing your deadlift weight. Which will in turn, help you get leaner, fitter, stronger and live better. That is the whole point of deadlifting in the first place, right? Make sure your deadlift form is perfect. At least as good as possible. Because as you know, bad deadlift form can be a big problem, especially for your back. And if you have ever had a problem with your back, you know how painful that can be. Even incapacitating. I am sure preventing lower back injury is important anyone doing deadlifts. How much weight you deadlift is not the main goal! Your first goal in learning how to deadlift is to perfect your deadlift setup and form. A proper form deadlift will make your back stronger, along with the rest of your body. The deadlift is one of the most powerful exercises that you can do to get fit and strong in body and mind. At the same time, you must respect the deadlift and learn to lift safely. Then, you can enjoy the amazing benefits of deadlifts. With that in mind, I tried out a new way of setting up for the deadlift. I had been setting up for the deadlift by using the Romanian deadlift as a cue. Before I reached down to the bar, I imagined that I was doing a Romanian deadlift. The purpose of that was to keep my glutes and hamstrings activated. Active glutes and hamstrings engage the posterior chain, rather than the small muscles of the back. Well, that seemed to be going okay till last week. I felt a bit of a twinge in my back and immediately looked for a new deadlift setup. Because a twinge in the back meant that I still did not know how to deadlift. 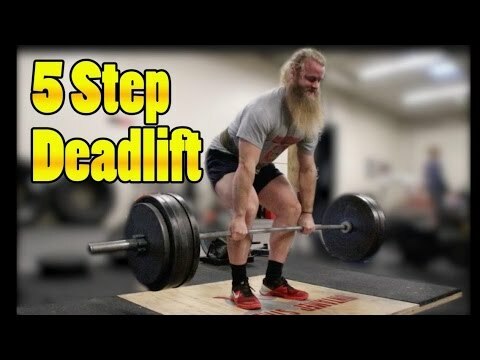 I came across a deadlift setup tutorial by Alan Thrall, a powerlifter and strongman from California. His conventional deadlift setup is based on the book Starting Strength, written by Mark Rippetoe. I tried out this 5 step deadlift set up this morning. All I can say is so far, so good! Even more than that, I can say that the deadlift workout felt great, both in the lifting and lowering phase. Especially in terms of back stability. And I can report to you that 3 months later, I added over a 100 pounds to my deadlift. I started with 10 pound bumper plates on the olympic bar, which is 65 pounds total. Start with light weight. So far, so good, always respect the deadlift. First, as with any strength training session, make sure that you warm up. Do not lift weights without a minimum 5 minute warm up. Do jumping jacks, inchworms, floor bridges, to warm up. Good, now we can focus on the deadlift setup. If you are a beginner, start with low weights. The best way to do this is to use an olympic barbell with 5 or 10 pound olympic bumper plates. Using olympic bumper plates will keep the barbell high off the ground even if you are not ready for 45 pound plates. This will help you to keep your back neutral/flat when you deadlift. Put a 5, 10 or 15 pound olympic bumper plate on either side of your barbell. If you are not a beginner, still start with moderate weights. For advanced lifters, moderate weights start with 45 pound plates on each side. Walk up to the barbell. Do not move the barbell with your shins. Place your feet under the barbell, so that the barbell is mid foot. Your shins should be approximately one inch away from the barbell. According to Starting Strength, when the barbell is an inch away, this will be mid foot for every person on the planet. So, do not worry about your body type, just make sure that the bar is mid foot. If you are wearing long sweats, you can also check your foot position from the side. This is one reason to wear shorts and deadlifting socks instead of long workout sweats. Personally, I am a big fan of deadlift socks. Keep your feet about shoulder width or a bit narrower. Let your toes rotate outwards about 30 degrees or one o'clock. (If 0 degrees is 12 o'clock and 90 degrees is 3 ‘o'clock, then 30 degrees is 1 o'clock). The bar is mid foot. An inch away from your shins. Your feet are about shoulder width apart or narrower. Your feet rotate outwards 30 degrees or 1 o'clock. With your hands at your side, just bend forward and grip the bar. Bend over and reach down towards the bar with straight legs. If you need to bend your knees a bit, do so. Use a double overhand grip or mixed grip as you grip the bar just outside of your legs. Your grip should be about shoulder width. Do not move the barbell either forward or backwards. Your hands are around the bar with an overhand grip. Your arms are right outside of your legs. The third step of the deadlift setup will put your hips in the right position. Bend forward a bit at the knees till your shin touches the barbell. Do not move the barbell with your shins. At this point, your feet, legs, hands and hips are all in the right position. Now, your shins are touching the barbell, that is it. And your hips are in the correct position for the deadlift. Here is where you flatten your back. You want to get your back into a neutral spine position. Right after you touch your shins to the barbell. Tighten your entire body while lifting your chest. You will see that as you lift your chest, your back will flatten out. Now, you are in position to start your lift. My back felt strong and stable using this technique. I think yours will too. Remember, the key is to lift your chest after your shins come in contact with the bar. Now your deadlift setup is complete. Yes, now is time for your deadlift. Drag and pull the barbell up your body. You want the barbell to stay in contact with your body during the entire deadlift. Please wear long pants like these and/or get a pair of deadlift socks. I use the socks together with the long deadlift pants. I tried them out yesterday and they were great, I wore shorts and could easily see the bar over midfoot. Or, if you do not have workout pants or deadlift socks, use deadlift shin guards. Keep your body tight, the position you had it in when you lifted your chest. As you pull the bar up, do not just think about lifting the weight. You also need to think about pushing against the floor. Your skeletal muscles are voluntary muscles. This means you need to think what you want to do in order to activate the appropriate muscle(s). You drag the bar up your body while pushing from your feet against the floor. As the bar passes over your knees, make sure to use hip thrust to straighten out. You should not feel the lift in your back. 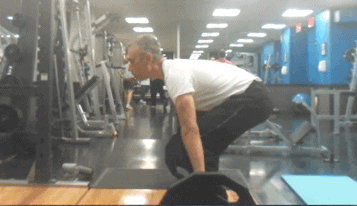 If you feel the deadlift in your glutes and hamstrings, you are using proper deadlift form. For Goodness Sake, Begin Deadlifting! F – feet, G – grip, S – shins, B – back and D – drag. That is my attempt for an easy mnemonic to remember the 5 step deadlift setup. If you have a better one, please suggest it. In the meantime, next time you go to deadlift, remember the mnemonic. What is Your Best Technique to Learn How to Deadlift? Watch Aaron Thrall Demonstrate the 5 Step Deadlift Setup. How do you set up for your deadlifts? Do you have a better way for learning how to deadlift? Please share the 5 step deadlift setup. Just pin the image below, thank you!